Beautiful home on 2 acres with creeks, flat garden space and yard, pastoral views and only 10 minutes to Boone. Wonderful quiet neighborhood of newer homes on a dead-in street with paved private drive. Less than 2 miles to the Blue Ridge Parkway. Light-filled living room with cathedral ceilings and a wall of windows. 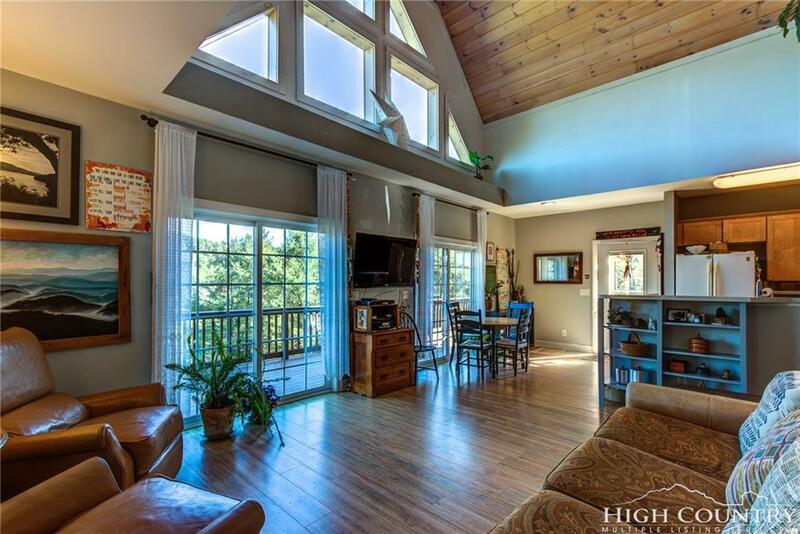 This home features an open floor plan and tons of outdoor living space with a wrap around deck and patio area. Main floor master suite. Superior wall foundation ensures the daylight basement is insulated and dry. The lower level has a private suite with huge walk-in closet, beautiful bath and adjoining den with french doors leading outside. Great storage and laundry area. Upstairs you'll find a huge loft which is presently being used as a 3rd bedroom and could be closed in to provide more privacy with minimal cost. There is a new bridge across the creek with 6 I-beams, steel plate and decking. FLAT yard with 2 creeks, fire pit, playground and area for a garden or outbuilding. Blueberries and an apple tree to start your garden! PRICED TO SELL QUICKLY! Schedule a showing today.